A Nonotuck Night For Love & Harmony is a fundraising event to support Nonotuck Resource Associates’ “Gift Giving Fund”, where 100% of proceeds go directly to folks the organization serves, supports and advocates for. Past donations to this fund have been used to supply folks with computers, adaptive equipment for their houses, special trips they would otherwise not have the opportunity to pursue, as well as supporting the families of those served with life’s hardships such as funerals and relocation. The benefit will be taking place on October 7th, 2017 at the historic Academy of Music Theater in downtown Northampton, MA and will be open to the public. Performing that night will be local singer/songwriter Grayson Ty who will be joined by Boston’s own Session Americana. Headlining the evening is a very special guest and an artist belonging to Northampton’s own Signature Sounds Recordings: Heather Maloney. 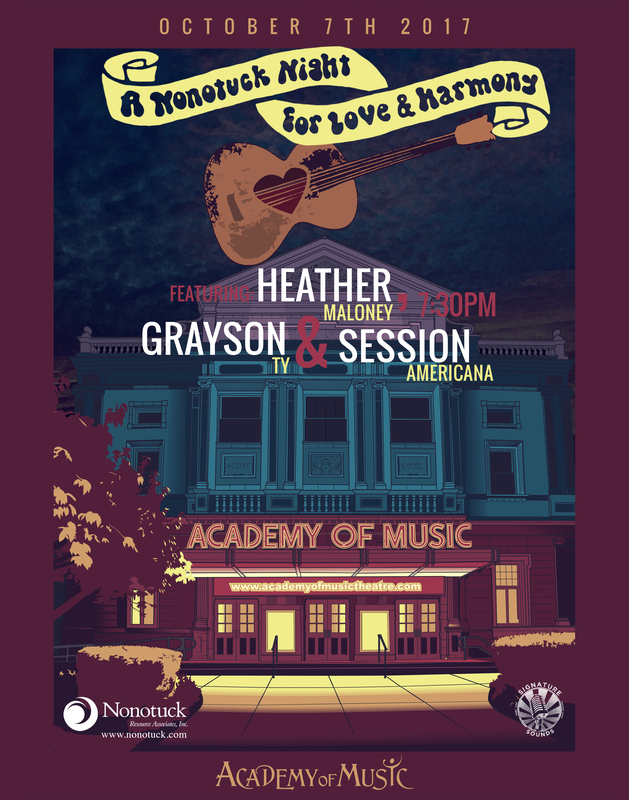 Join us for A Nonotuck Night For Love & Harmony.